In the last few years, with chronic depression, insomnia and disenchantment with myself and the world at large, it was one of those time-loved activities that was mothballed, less as an active choice and more as ambivalence-in-motion. You have to care enough to make the effort and I just didn’t care any more. Mercury turns retrograde today, and yesterday (as it stationed) I went on a mission to assemble a feast of reading for the next three weeks. With the exception of The Passion (which I first read in October 2015) these are books I have not picked up since life imploded in 2013. It would have been much longer. Yet another small activity that joyfully points that the tide has turned and I’m living on the verge of thriving again, rather than just surviving. 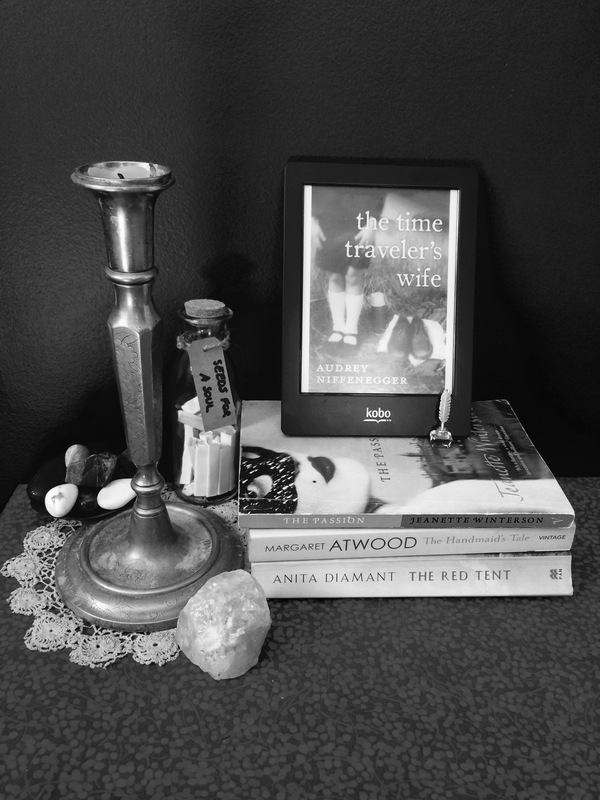 I’m beginning with The Time Traveler’s Wife (which I had to go and buy as an ebook because my papercopy cannot be found?) I’m not sure where I will go from there. Probably The Red Tent. And so on. And so forth. Do you re-read books? If so, what are books are on that list? What one will you pledge to pick up and read in the next three weeks? 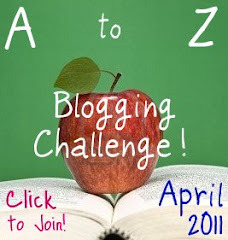 I came across the fabulous Blogging from A-Z Challenge in the middle of March – around the same time I faced up to the prospect of a pending meltdown if I didn’t do something about my work schedule. The answer of ‘what do I do?’ was apparent within an hour, amid the mess of tears, shakes and while the echoes of my yelling still echoed around the house – I needed a break – a month. One month away from the rigours and stresses of work. One month to get myself grounded and focused on what I really wanted for the rest of the year. A month to get my home cleaned and tidied. But most importantly, a month to write. So when I stumbled across the A-Z of writing I knew it was something I definitely wanted to do in April, given also I was taking the entire month of April off. One of the points on my yet-to-be-committed-to writing plan for 2011 is to aim toward being listed as one of the 50 Best Australian Writing blogs. It’s unlikely given the start to the year I have had – but it won’t stop me trying for an honourable mention. For the next 26 Day (Sundays exempt) I’ll be blogging. What will I be writing about – life, the Universe and everything, most probably. There will be some interviews from my writing fraternity. At the moment I can say there will be questions pointed at Emma Newman and Carrie Clevenger, about their respective projects From Dark Places and Crooked Fang (but that’s only because I’ve really only thought up to “F” in the alphabet – though Carrie’s is likely to fall under “V” for vampire!) There is likely to be reflections on returning to the page to write, possibly some flash fiction and articles about writing, editing and publishing. I’m trying to plan ahead – but I’ll probably fly by the seat of my pants. April, other being my month of ‘authenticity’, is also mostly given over to the backward tracking of Mercury. To honour this energy I’m returning to read two of my all time favourite books – The Time Travellers Wife and The Handmaid’s Tale. I’ve committed to The Inaugral Sub-date Challenge so I’ll be reviewing my back catalogue of stories and doing what needs to be done to prepare five of them for submission. There is an unfinished letter writing project I started that I’d love to finish (inspired by Mercury Rx in 2009). I’m also aware my thoughts are closer to the surface than normal and as a consequence more powerful. It’s time to really start manifesting what I want. April is the month I’ll be hitting the footpath in an attempt to return to some kind of regular physical activity. I love this article about Walking as Meditation for Writers by Patricia Fry. Back in October 2007 when I first decided to start writing fiction again, I came across this awesome article on Kim Falconer’s website and it struck an immediate chord. I’ll be back on the caffeine-free, sugar-free and alcohol-free wagon after a month off it and feeling gross as a result. Of all my vices, I’ll miss a beer on a Saturday afternoon the most. As I’m writing all month, I need to stoke the creative fires – firstly with lots of walking, but secondly with lots of mundane work around the house – cooking, laundry, cleaning etc… to support that inner creative landscape (I love the fact my creativity intended for us all to eat and have clean clothes… but not so interested in us having a clean house!) My plan is also to cull books from my bookshelves – mostly the birth, breastfeeding and early parenting books which I’ve moved beyond. Have yet to decide if I will sell them or just give them away. We have many boxes of books which need homes on shelves. I also have several sewing projects to tackle. Lastly April is dedicated here in Australia to honouring and recognising Australian Writers. While my novel stack isn’t reflective of this, I have three copies of Andromeda Spaceways Inflight Magazine (including a brand new one which arrived Friday) to read. 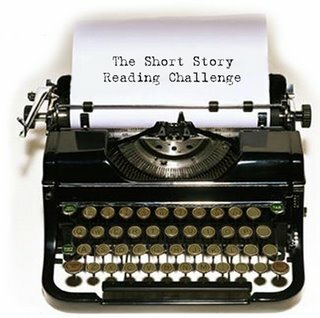 I might step out of my comfort zone and review some of the short stories. There are also a number of events I’m planning on attending in honour of the release of Anita Heiss’s Paris Dreaming here in Brisbane. Anita is a beautiful soul and I’m looking forward to meeting her in person after months of conversing on Twitter and a quick chat on skype during January and the initial phase of 100 Stories for Queensland. All in all, April is about me – working out what I want from here on in (perfect to do during Mercury Rx). My plan at the moment is to return to business in May working three days a week and writing the other two. When Paul and I first set up eMergent it was with the view it would open up time and support our writing – we’d be able to work half a day and write half a day. It hasn’t panned out that way so far, but it doesn’t mean that it has to continue like that intot the future. I know I have big plans and the time at my disposal doesn’t allow for all big plans to see the light of day. But I know I can’t keep going on at the pace I have been this year. I also know I can’t keep going, surviving on next-to-no writing. After all, I gave up editing and publishing in 2008 to pursue writing. I must never again lose sight of that. Beginning in earnest next week, I will be committing to read one short story a day, for a year… as my own weird twist to the 365 Day challenge and also as one area of my professional development for 2010’s Year of the Silver Tiger. I write them, but I never read them. Despite my best efforts I find anthologies impossible to get through, cover to cover. At night I’m too tired and distracted to want to make the investment to get to know a new character and go on a journey with them. I want to pick up a book where I already have befriend the character and am eager to continue on with the story. It might only be five pages some nights, other nights it could be 20 or 30 pages. It seems pretty likely that I am not going to stop writing my own short and flash fiction any time in the near future, so I’m adopting the philosophy that you should ‘read in your genre’ (substituting genre with form). For the past three mornings I’ve taken the ‘story a day’ for a test drive with some pretty amazing results. Day One (Monday) I grabbed the first anthology my hand fell on, which turned out to be 10 Short s\Stories you Must Read, a promo anthology (not for sale) from the Books Alive 2009 campaign. Our old flat mate scored it last year and it got left behind when he moved out. I was in a pretty awful mood, if I’m being totally honest Monday morning. It was my son’s fourth day at school and ‘the empty nest syndrome’ was descending on me like grief shroud, sapping my will to do anything and killing my creativity dead in its tracks. Enter left of stage Robert Drewe and his wonderful story View from Mount Warning. By the time I had finished it was out of my funk, had drunk my pot of tea and was inspired to get in the car, go home and get on with it. It wasn’t the story per se which was the motivator – it was act of shifting my attention away from feeling sorry for myself and into a creative space which seemed fifteen minutes earlier, was most definitely light years away and perpetually barred from me. It seemed a pretty strong indicator I was onto something. After Monday I felt a short story was the perfect way to ‘warm up’ for the day and embarked on my second, Kathy Lette’s Hate At First Sight and William McInnes’ Life in a Hotel. It definitely has an easy fit slot into my writing day – simple to start, easy to finish – completed in the time it takes to drink a cup of tea. It is getting me reading stories I would have missed or have been meaning to and never got around to. It is getting me reading authors I would never normally come into contact with. It is giving me a better feel for the form and structure of work which is published. It has me wearing all my hats at once; reader, writer and editor in a way where they can all hang out together as equals. It has me thinking and writing criticially about what I am reading. It is cementing my love of the the short story. I’m going to continue on for the next 11 days and imagine it will be a seamless transition into the ‘officia’l story a day for a year on the 14th. Care to join me? Image via One More Chapter. 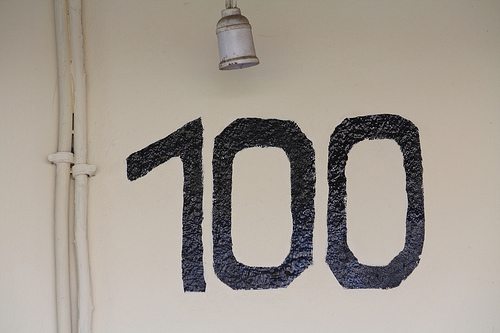 As promised last night – here is the second of three parts of Borders 100 Favourite Books. 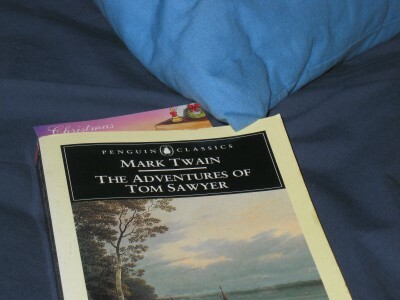 After seeing Sherlock Holmes this evening I did what I have been dying for days to do – curled up with my book.